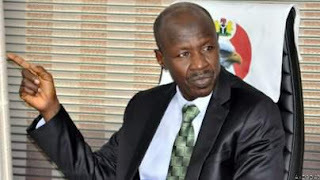 The EFCC boss, Ibrahim Magu, spoke on the theme: “Roles and Obligations of Managing Directors of Banks in Nigeria in Curbing Vote Buying During an Election, Illicit Financial Flows and Other Related Matters in Nigeria”. Ibrahim Magu, the acting Chairman of the Economic and Financial Crimes Commission (EFCC), has accused 10 unnamed commercial banks of money laundering. Magu stated this on Friday, while speaking at a round table meeting with managing directors of financial institutions in Nigeria. He said: “It is worrisome to note that in 2018, statistics available to the EFCC shows that out of about 28 commercial banks in Nigeria, 10 banks evacuated out of Nigeria through Travelex Nigeria Limited the sums of GBP- 50,832,560; USD-8,057,756; EURO-39,986,560 and RAND-7,500,000.